For pediatricians, emergency physicians, family physicians, nurses, nurse practitioners, paramedics, respiratory therapists, and other healthcare providers who initiate and direct advanced life support in the neonate. 3. Instructor-Led Event Evaluation, Components 2 & 3 will be completed after attending the Instructor-Led Event at The HealthSource. First-time students, create a User ID and Password. If you previously registered, sign-in with your credentials. You can purchase the 6th ed NRP Exam (through December 2016) and the 7th ed NRP Provider Curriculum (required for everyone starting January 1, 2017) in the catalog. Please check with your work place to see which edition you are using. 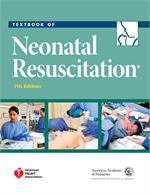 You will need the Neanatal Resuscitation Text Book 7th Edition. The NRP requires self-study, the participant will need to have the book several weeks before the beginning of a course or evaluation. You will need to purchase your manual by going to www.aap.org or call 1-888-227-1775 . Please contact The HealthSource for Pre-Requisites.